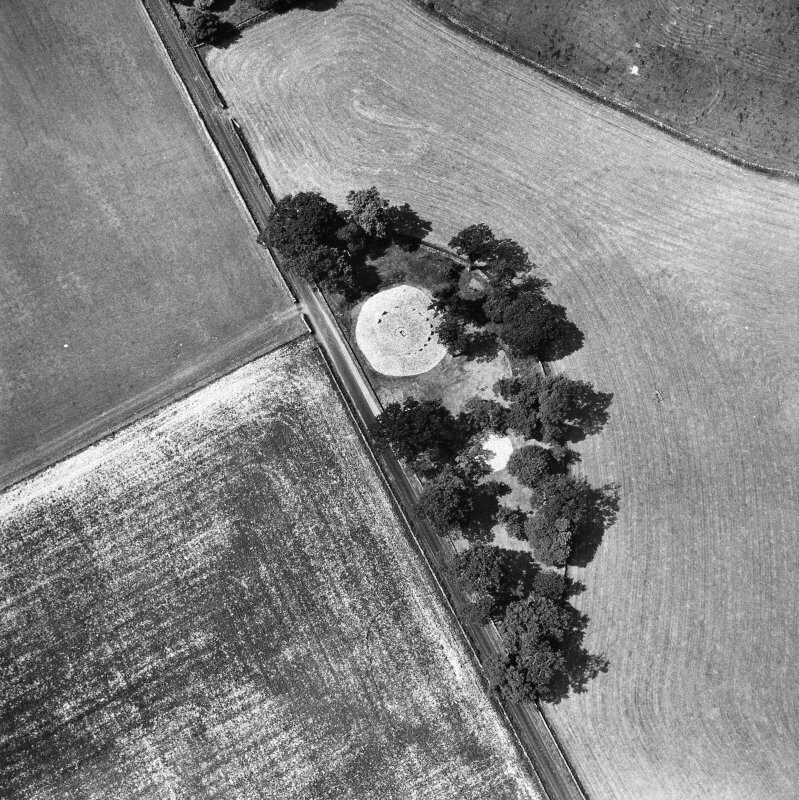 Oblique aerial view centred on the remains of the stone circles with the remains of the standing stone adjacent, taken from the SE. Publication drawing; Temple Wood, detail of N cairn. Temple Wood General view of excavation. Publication drawing: Temple Wood, detail of central cairns. 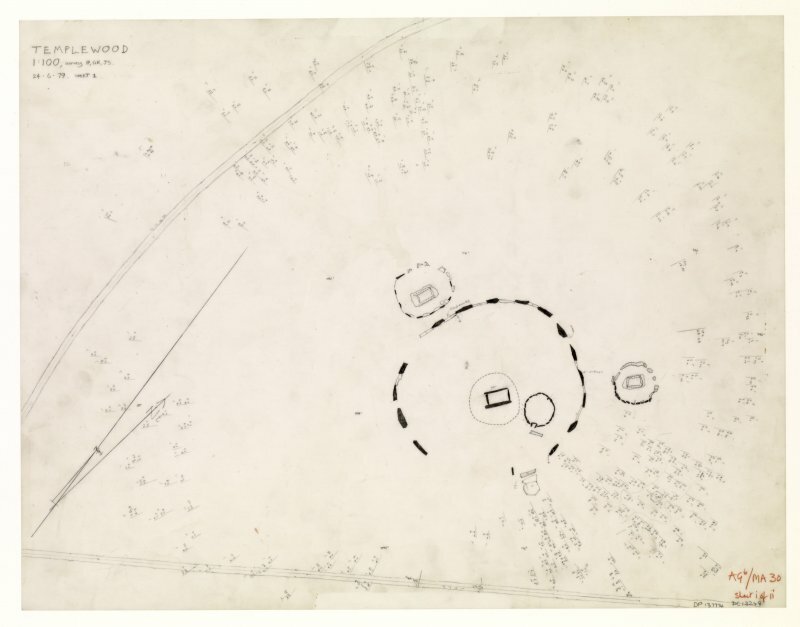 Digital image of plan of Temple Wood stone circles. View of Templewood stone circle. 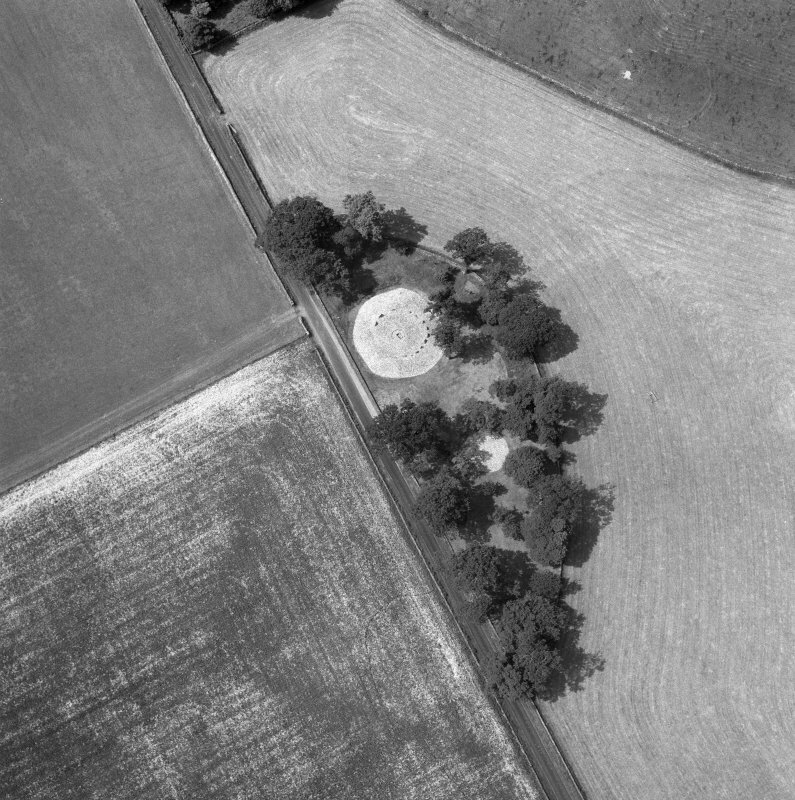 Oblique aerial view centred on the remains of the stone circles with the remains of the standing stone adjacent, taken from the SW. 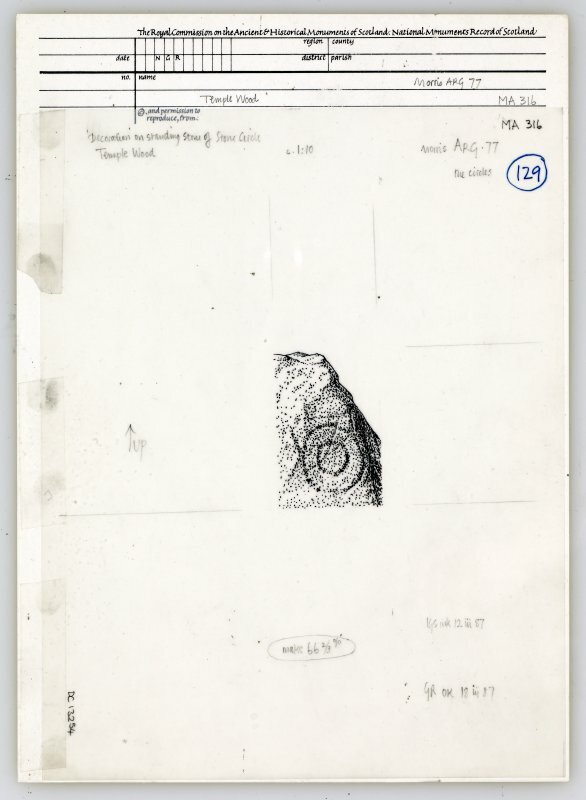 Publication drawing; Temple Wood SW circle, upright stone, showing spiral decoration. Photographic copy. 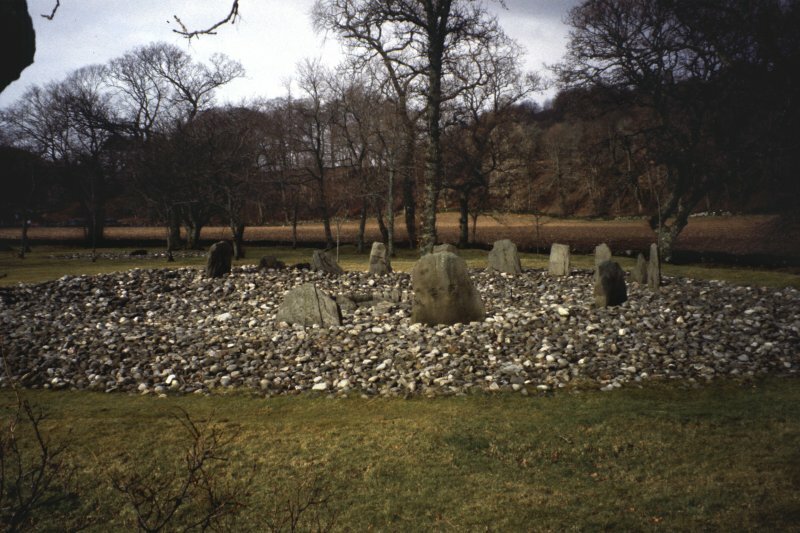 General view of stone circle. 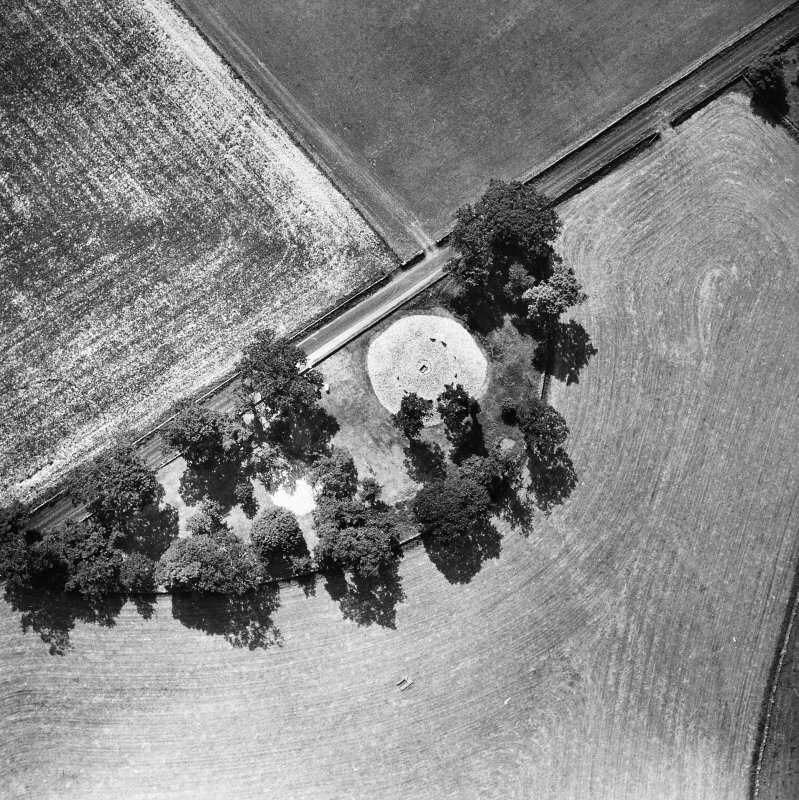 Plane-table survey; Temple Wood. Sheet 2. Ministry of Works plan, Temple Wood circle. Survey drawing; Temple Wood stone circles. 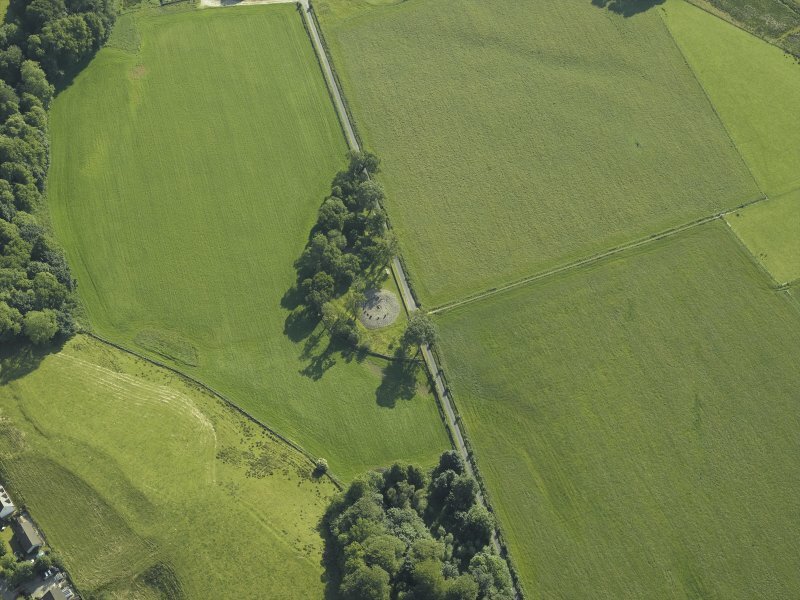 Oblique aerial view centred on the remains of the chambered cairn with the remains of the standing stone and stone circles and the farmstead adjacent, taken from the ESE. Publication drawing: Temple Wood, detail of central cairns. Photographic copy. 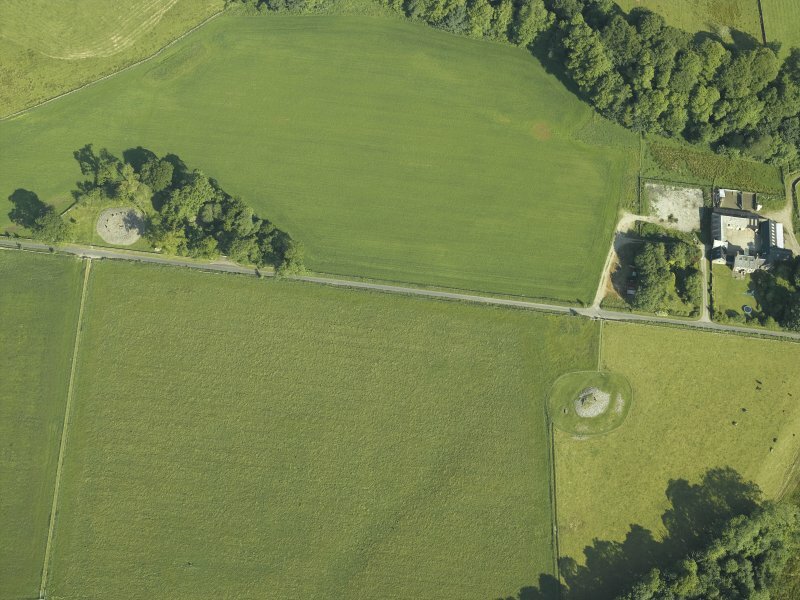 Oblique aerial view centred on the remains of the stone circles with the remains of the standing stone adjacent, taken from the SSW. 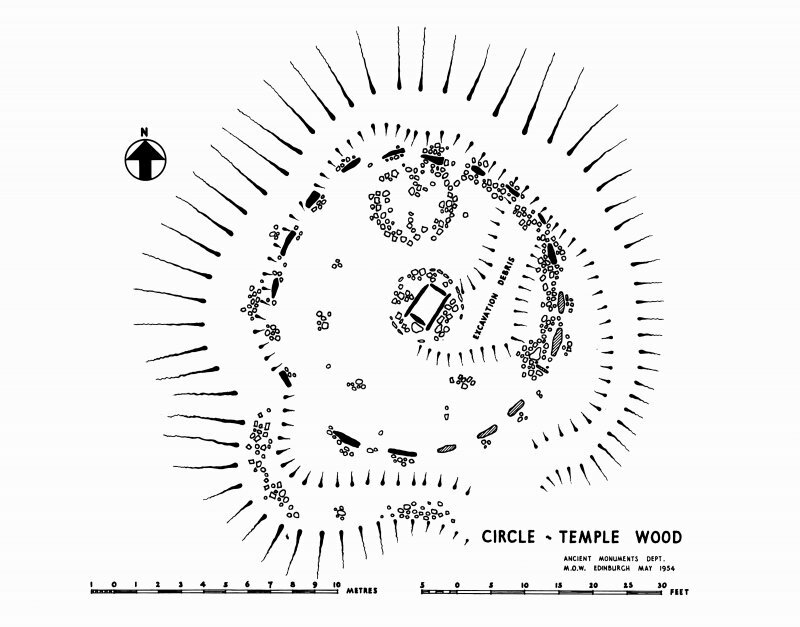 Publication drawing; Temple Wood SW circle, upright stone (a) on plan, showing concentric circles. Photographic copy. 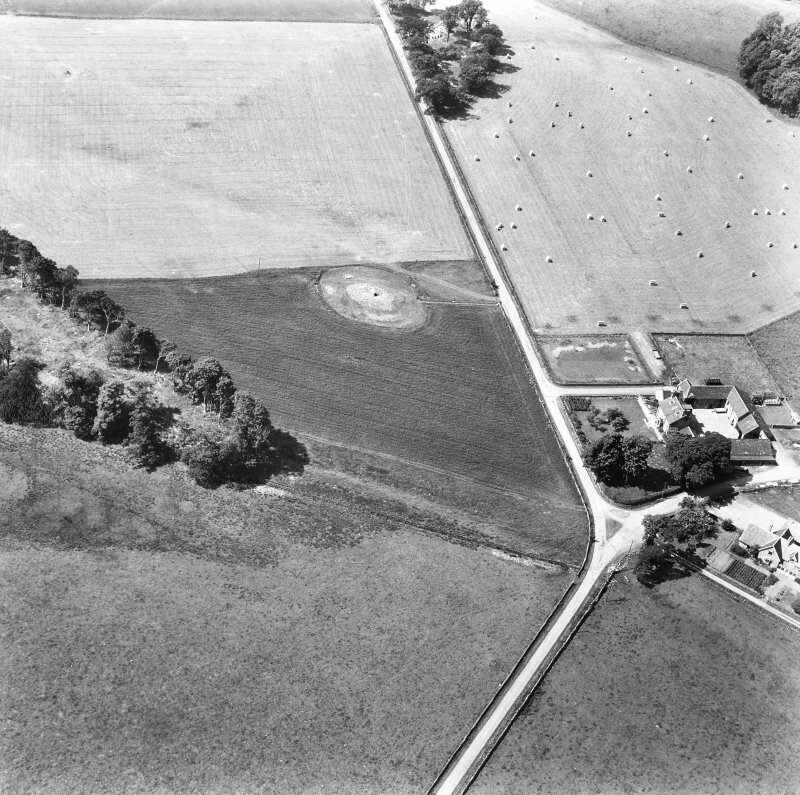 Oblique aerial view centred on the remains of the chambered cairn with the remains of the standing stone and stone circles and the farmstead adjacent, taken from the SE. Publication drawing; stones circles, Temple Wood. Outline ink drawing without tone. Photographic copy. 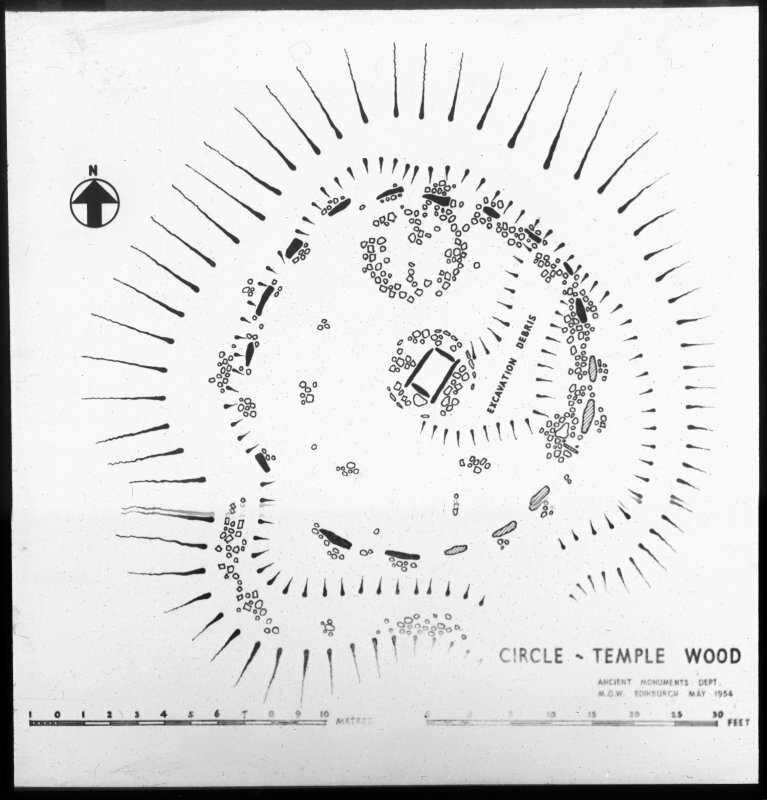 Publication drawing; Temple Wood SW circle, upright stone (a) on plan, showing concentric circles. 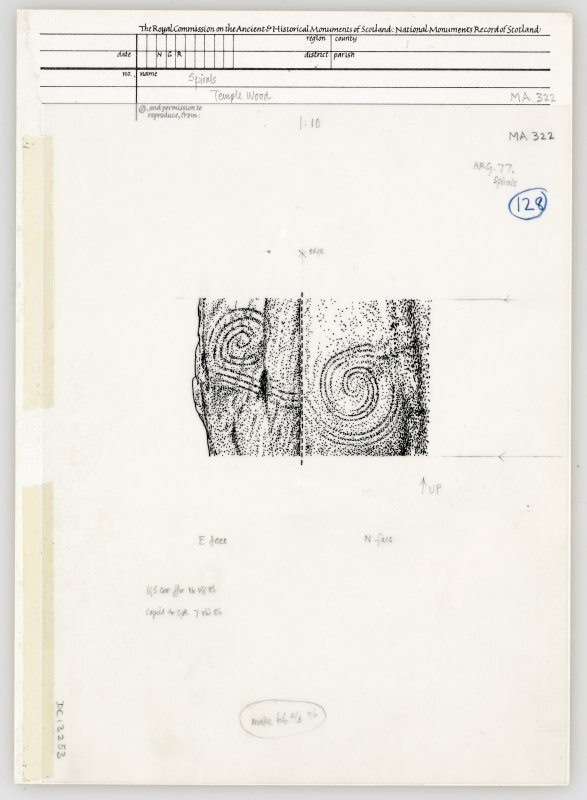 Publication drawing; Temple Wood SW circle, upright stone, showing spiral decoration. 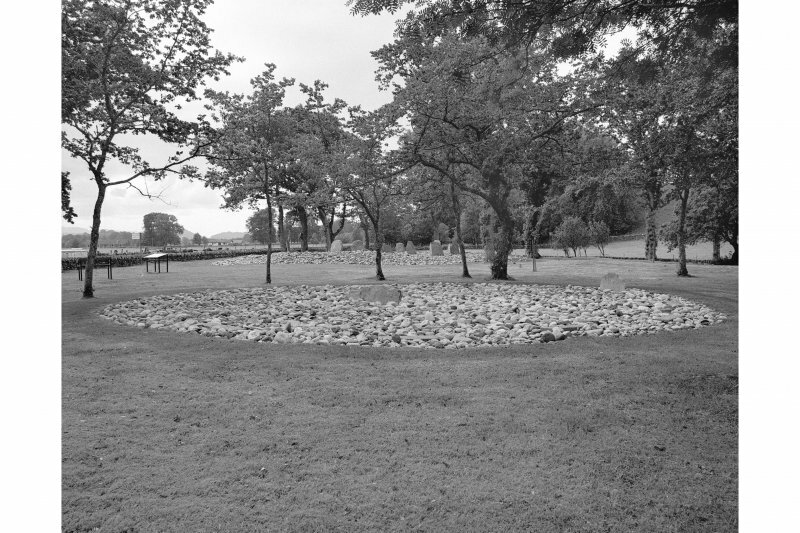 An earthen bank surrounds a ring of stones 43' x 40'6" in diameter. 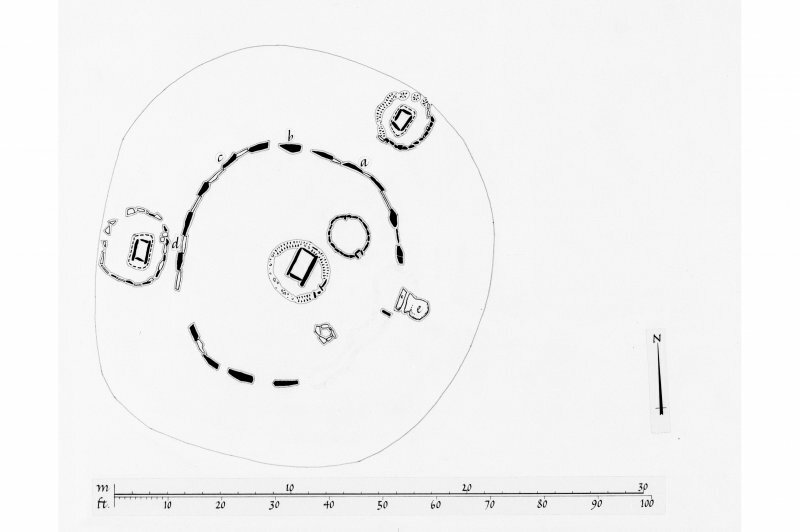 Thirteen stones, heights as shown on plan still stand, and the sockets of seven others, completing the circle, were traced by Craw's excavation of 1929. There is a low inner stone setting, surrounding a central cist. Prof. Thom's plan shows an outlier to W, which he says was removed in 1953. An axe-head is carved on the head slab of the cist. Generally as described. The earthen bank surrounding the stones has been mutilated on the SW side. The central cist is exposed and measures 1.5m x 0.9m x 0.5m Lying 30.0m to the N of the circle are two stones set on edge; their purpose is not certain. The suggested axehead is unrecognisable. 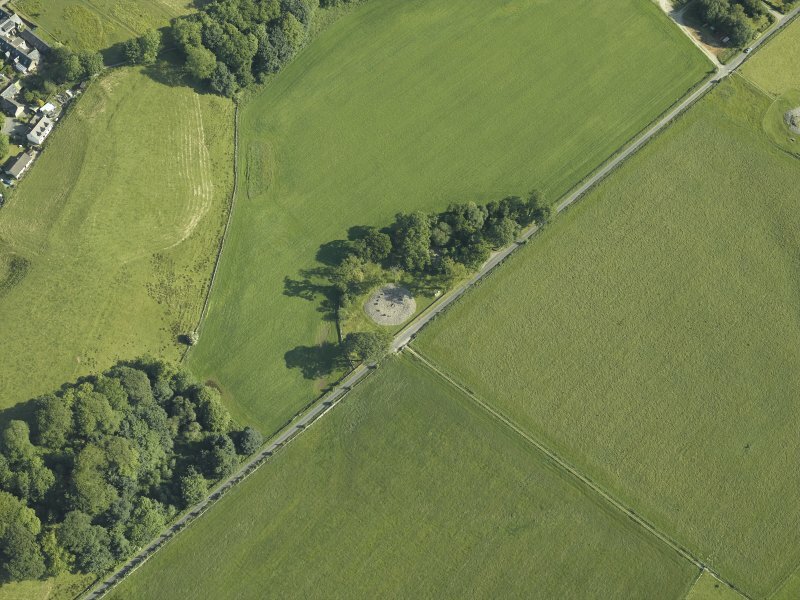 This site is being re-excavated to try to establish the relationship of the standing stones, forming a circle c.12.2m in diameter, with what appear to be cairn material and ditch features. A quadrant to the SE was examined with sides which intersected in the central cist. The N section of the quadrant included a small stone set at right angles to the perimeter, discovered by Craw in 1929. 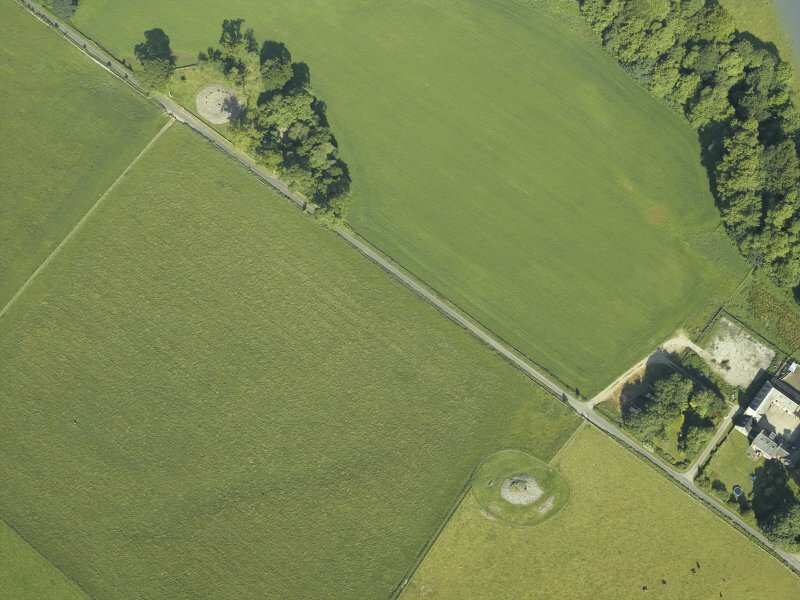 Beneath modern turf, the central area had a layer of cobble-like stones ranging from a thin scatter towards the middle to c.0.5m near the standing stones. Two of the stone holes found by Craw were confirmed, showing drastic disturbance which must ante-date Craw's examination. About 4.0m SE of the central cist was discovered a coverless cist built of slabs apparently laid flat on the original surface. It was 1.1m x 1.0m in size and contained a cremation. 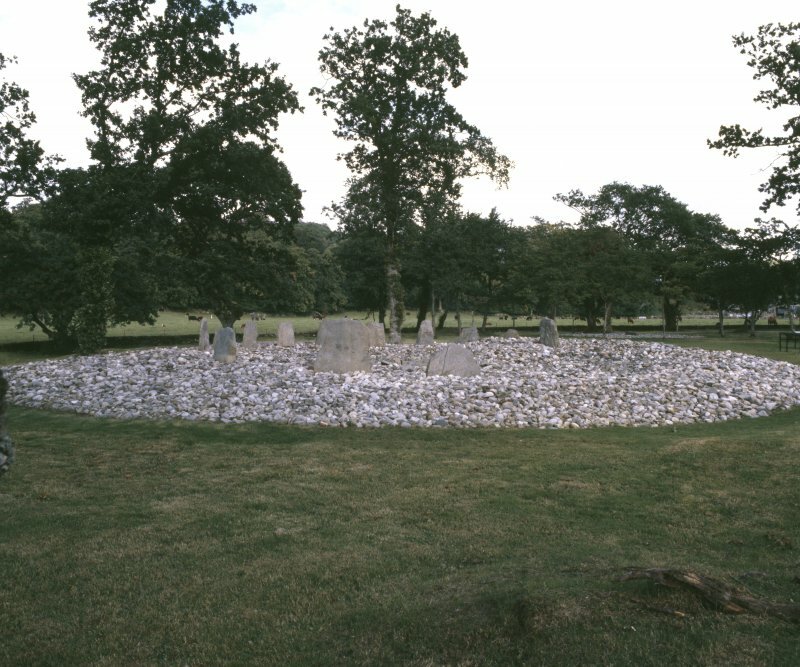 Surrounding the central cist, and only fairly recently turfed over, is a ring of an estimated diameter of 3.5m, composed of closely set small upright slabs and split boulders. 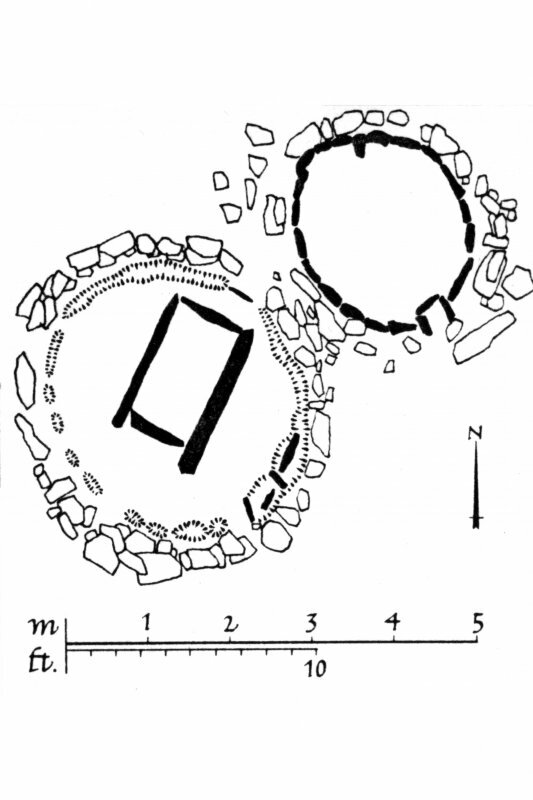 On the inner side of this ring and to the E of the central cist was a damaged slab-built box-like structure, 0.8m across, in which were found cremated remains. The central cist, which has lain open for many years, also contained cremated remains. The W section was extended across the ditch visible to the S and outside the ring of standing stones. The ground fell away 5.0m to the S of the ring, to flatten out again c.1.0m lower down. At the break of slope the ditch proved to be c.2.0m wide and less than 0.5m deep. It appears to cut through cairn material on the N side. 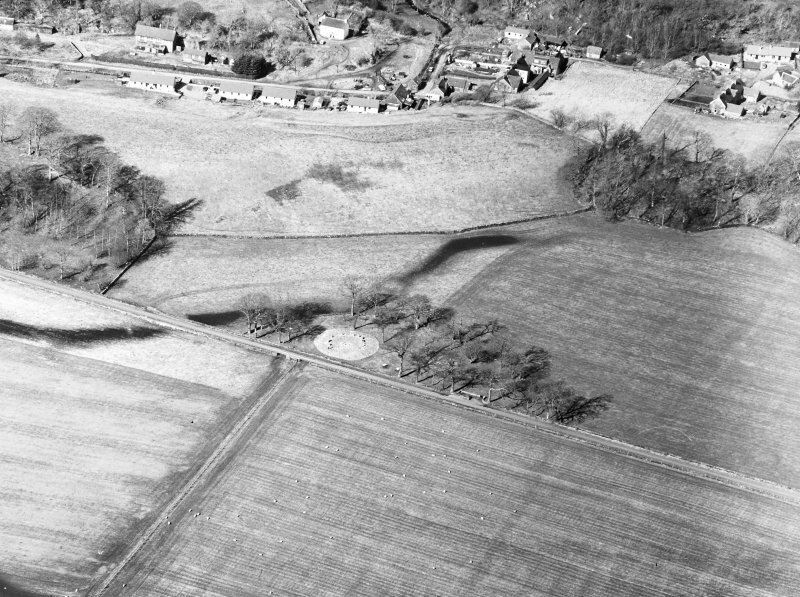 Present indications are that it is not prehistoric, but may be a drainage ditch dug when peat formerly surrounding the site was being removed (J G Scott 1974). 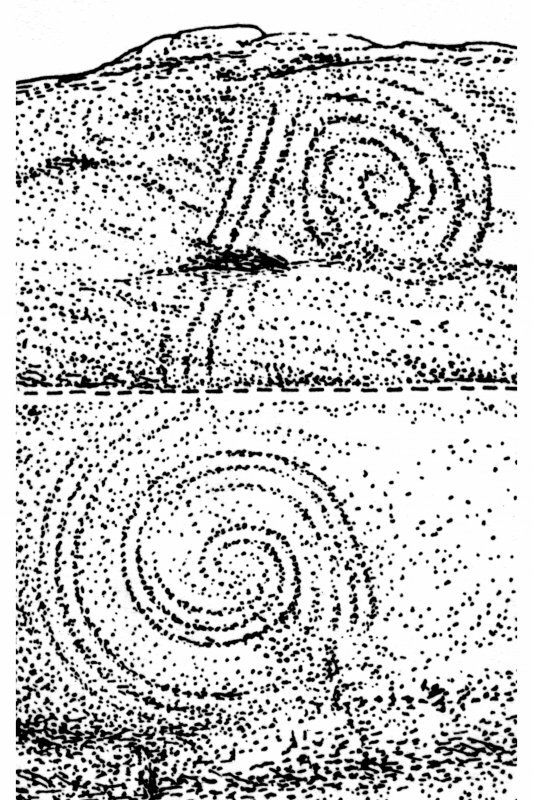 Hawkins notes a large six-armed double spiral carved on the E edge of the N stone of the stone circle. Excavation of the new quadrant in 1975 revealed, surrounding the central cist, a narrow trench which had contained upright slabs, one of which, partially shattered, survived. A ring of set boulders remained in situ immediately outside the trench and it is likely that boulders, slab and cist had been covered by a small cairn. There was much disturbance between the central area and the standing stones but it seems unlikely that there was ever more than a scatter of stones here. 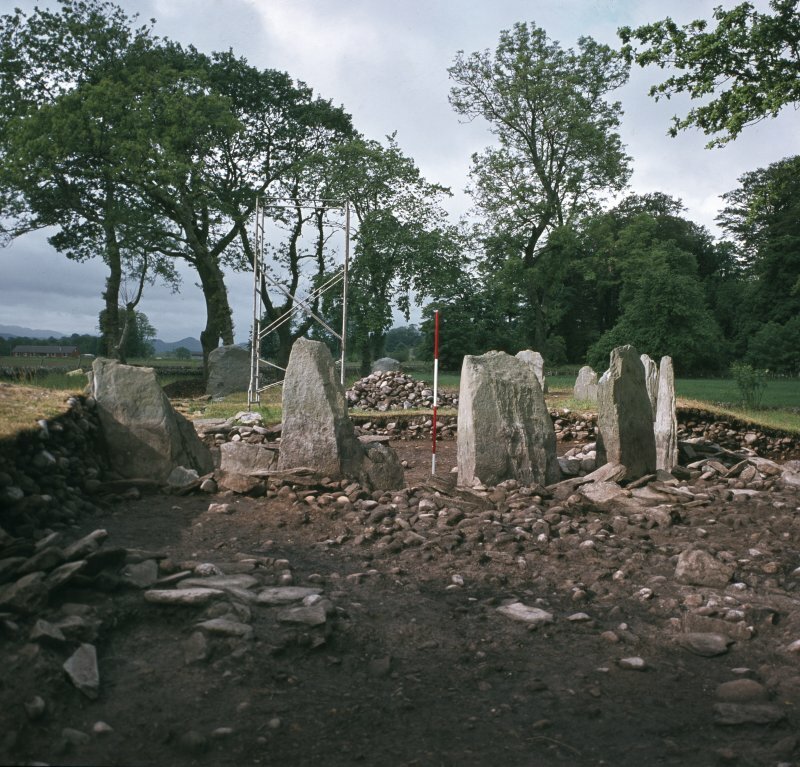 Four upright slabs, above one of which two courses of drystone walling occurred, were uncovered between the standing stones which appeared to have been dressed to receive them. Scott deduces that this must have been the retaining wall of a ring-cairn, but no outer kerb was traced. To the west, a ditch, which appeared to run N-S past the edge of the cairn, was cut and was shown to be of ancient origin although it had been recut in recent times. 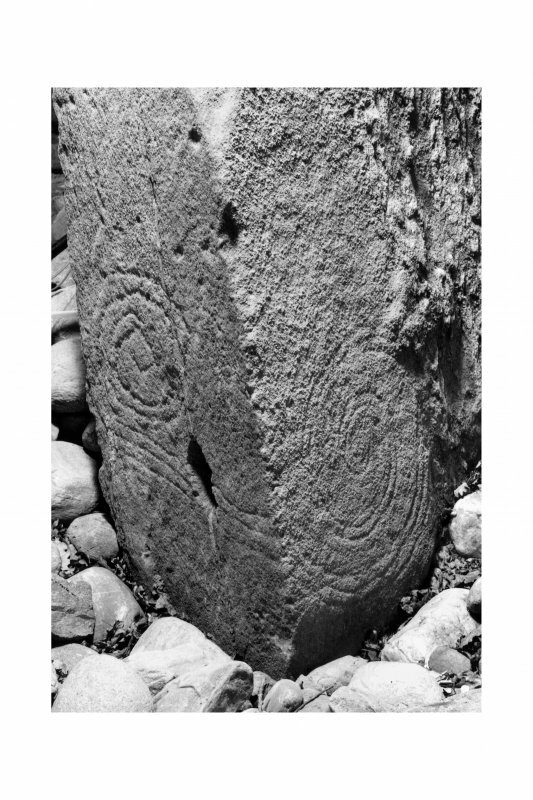 Two previously unrecorded carvings, one consisting of two concentric circles and the other a magnificent spiral were noted on the outer faces of the standing stones. 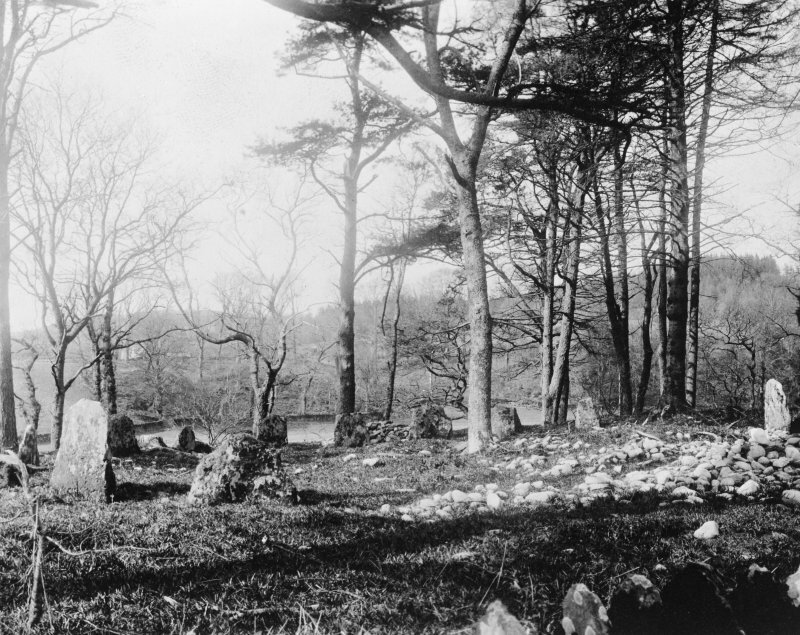 An embanked stone circle known as Temple Wood (DoE nameplate) is situated on low lying ground. There are now 13 upright stones (A to M on 1/500 plan) in the circle and they range from 1.1m to 1.6m in height; some are linked by earth-fast slabs set on edge and up to 0.3m high. 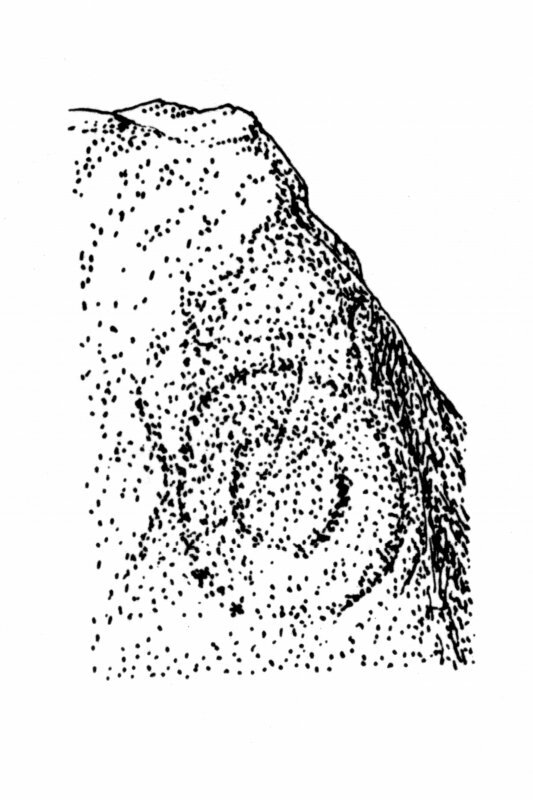 The concentric circle and double spiral carvings are on the N face and E edge respectively of Stone E. The external stony bank which is up to 1.1m high survives only on the NE and S, elsewhere it has been damaged or effaced by the excavations. 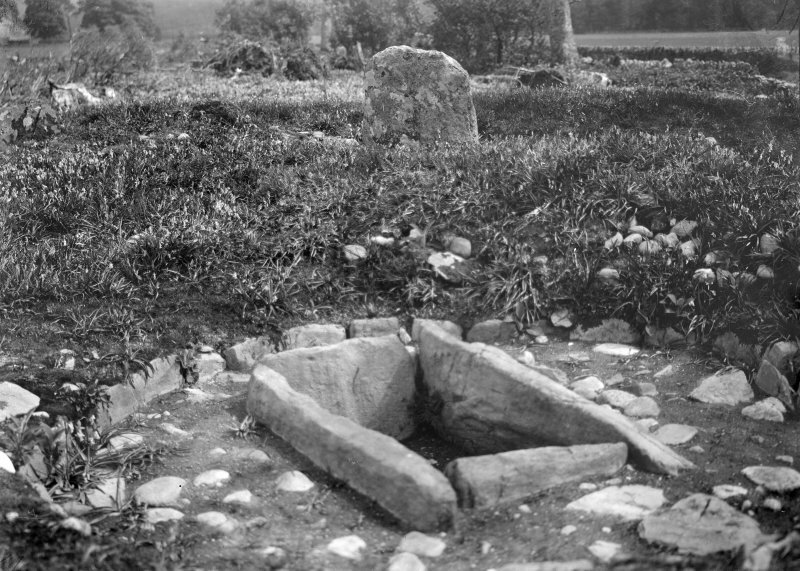 The central open cist (the only one evident) is well preserved but with no trace of a capstone, and the enclosing crescentic line of stones 0.2m high survives on its W side only. 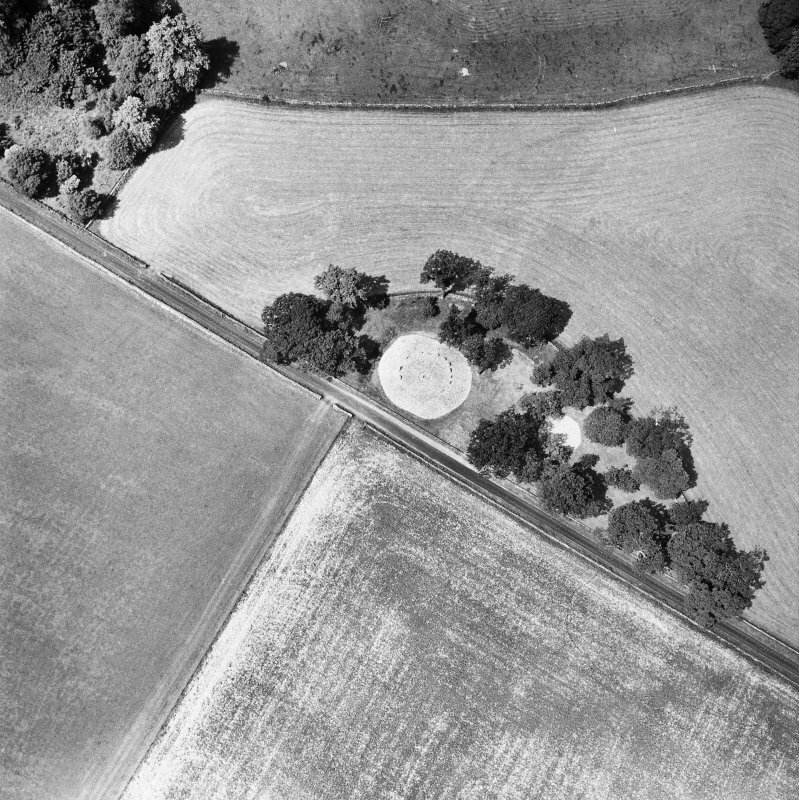 The amorphous mound immediately to the NE of the cist is possibly a spoil heap from an early excavation. Two earthfast stone slabs, (N and O on 1/500 plan) set on edge and protruding 0.4m through the turf, lie 30.0m to the NE of the circle. An 0.3m deep meandering ditch running generally N - S lies to the W of the circle, this joins an 0.9m deep ditch which runs E - W to the S of the circle. Their age and purpose are not clear but the latter is possibly modern. Excavation in the SW quadrant revealed a satellite cairn c.3.25m in diameter x 0.5m high containing an empty cist c.39m to the N 2 upright slabs project, one of which is set into a socket with a slabless socket set c.1m away. At the heart of tbe densest concentration of prehistoric monuments in Mid Argyll, the stone circles of Temple Wood lie on the NW side of the road between Nether Largie and North Lodge, Poltalloch; the chambered cairn of Nether Largie South (NR89NW 2) is 250m to the NE and the standing stones of Nether Largie (NR89NW 3) are some 300 m to the SE. 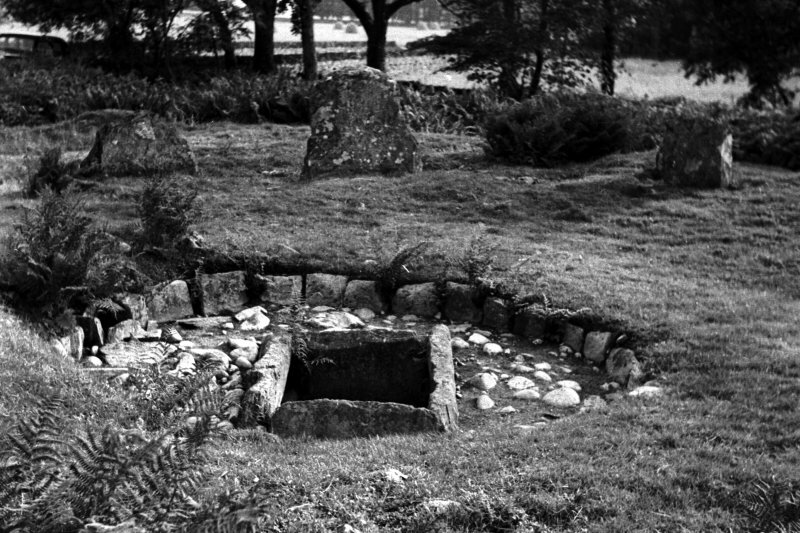 Excavations on two occasions, by J H Craw in 1929 and J G Scott between 1974 and 1979, have revealed a broad chronological sequence that links Temple Wood to many of the sites in the Kilmartin Valley; Craw's work was, however, little more than a superficial exploration, carried out during his more extensive digging at Dunadd (NR89SW 1). 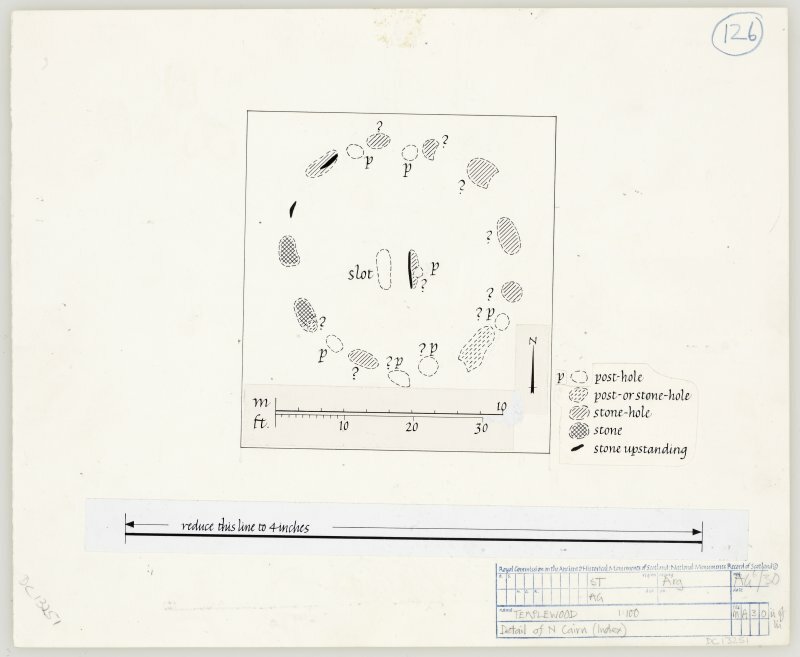 The structural complexity of the site was revealed for the first time during the six seasons of excavation undertaken by Mr Scott, and the following account makes use of the published interim reports as well as information kindly provided by Mr Scott (Scott 1976; Craw 1929 et al). 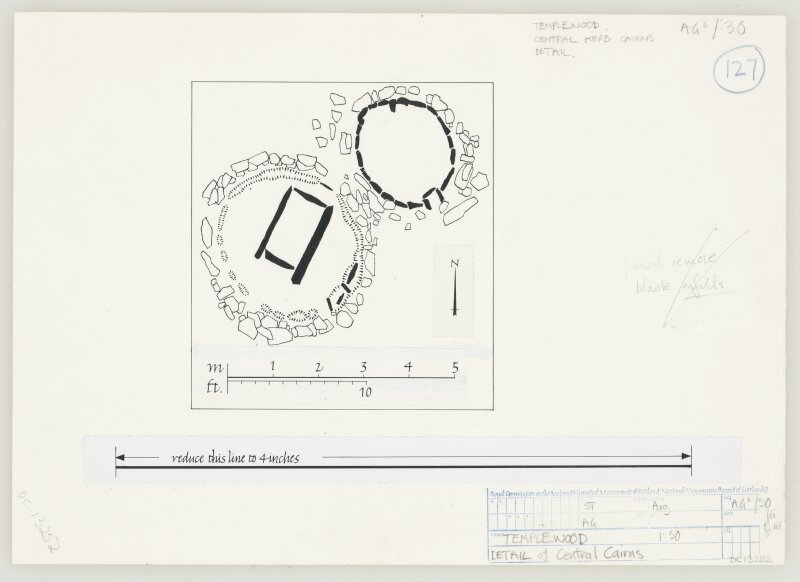 (The plan was begun in the course of the 1979 season of Mr Scott's excavation and it incorporates information from later work; it htus includes structures that are not at present visible, but does not include features that have subsequently been reconstructed. The Commissioners are greatly indebted to Mr Scott for his assistance throughout the preparation of this summary and for providing photographs in advance of his own excavation report.) 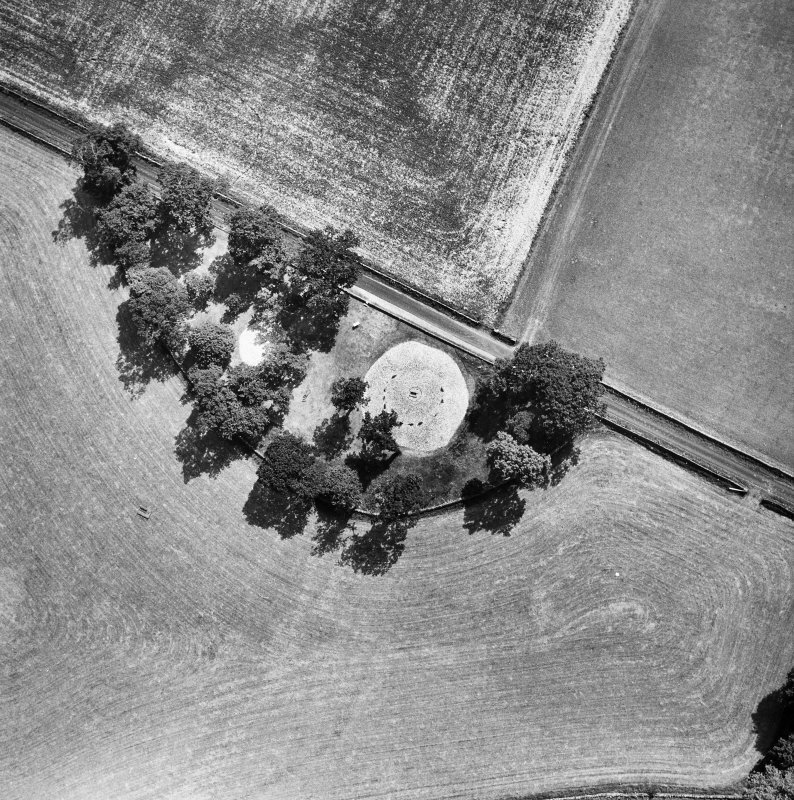 In addition to the previously recorded circle, Scott's excavations revealed a second, and in fact earlier, structure, here called the North-East Circle. 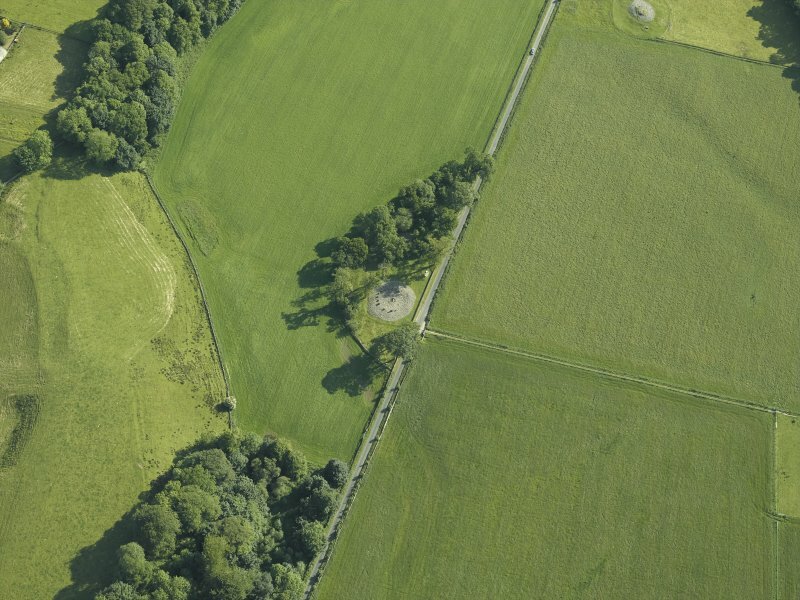 Following the recent excavations, both circles have been consolidated and prepared for public display by Historic Buildings and Monuments: Scottish Development Department. The chronological relationship of the main structural features of the two monuments could not in all cases be precisely determined, but the main phases may be outlined as follows: the earliest is represented by a timber setting in the North-East Circle; this was later replaced by a stone setting on the same spot, although this may never have been completed. 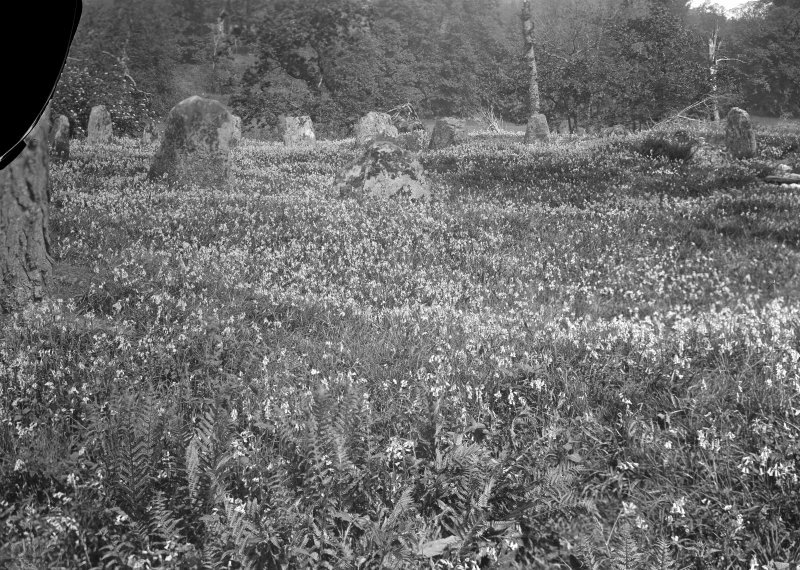 Subsequent activity seems to have been focussed on the South-West Circle, the most important part of the site, the earliest element of which is a circle of twenty-two standing stones; two small cairns, both containing cists, were built outside the stone circle on the NE and W; the spaces between the stones of the circle were filled with upright slabs, here called 'interval slabs', and the circle was thus made into a closed ring; this ring was then surrounded by a bank of stones covering both the external cairns. 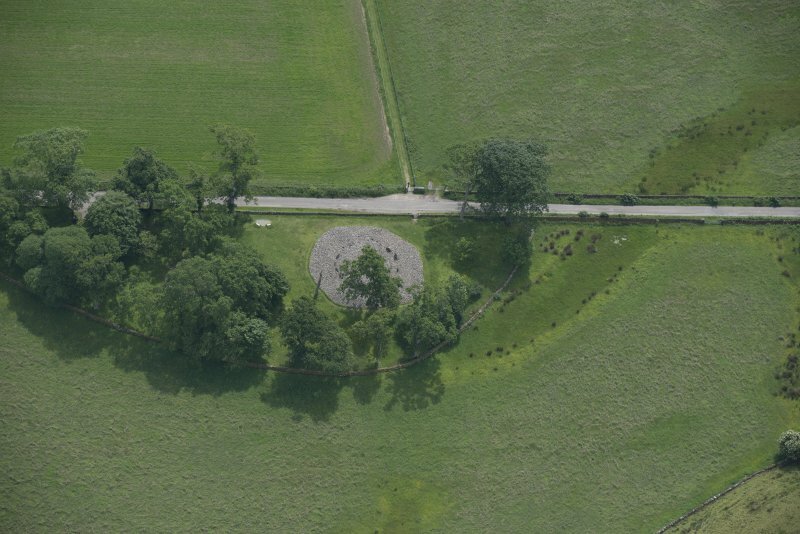 It is difficult to be certain at what point the structures inside the circle were built; there is a small stone setting on the SE, a central cairn with a cist, and a further circular setting to the NE of the central cairn. All the internal features were later sealed by a covering of cairn material. 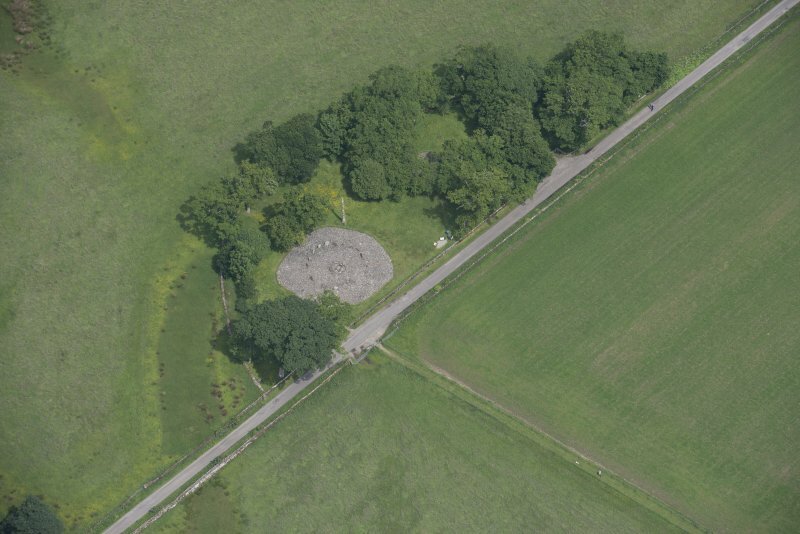 The major feature of the site is a ring of standing stones now partly masked by cairn material; the stones are laid out not in a true circle, but in an ovoid measuring about 13m by 12m. There were originally twenty-two uprights, standing to heights of 1.6m above ground level, but the stones of the SE quadrant have now been removed. When Craw examined the circle fourteen stones were recorded and the stone-holes of a further two were found on the SW; one of these contained the pinning for a stone that had been removed, and the stump of the second stone still remained in position. On the SE arc the positions of the missing four stones were 'clearly traceable by the deep soil' and in one of the stone-holes broken fragments of the stone were discovered. There is a stone on the SE, which is the only upright set at right angles to the circle; it measures 1.05m in height, 1m in width, and 0.lm in thickness. Two of the standing stones (a and b on the RCAHMS plan) are decorated with pecked ornament: one bears concentric circles (now very faint); the other has a double spiral spread across two faces of the stone, the better executed side (the outer face) bearing three-strand ornament, which curls to form a single-strand spiral. On the outer face of one of the uprights (c) there are several small possible cupmarks, and two more small cupmarks were recognised on one of the interval slabs (d). At the time of the destruction of the SE arc, one of the fallen slabs was partly shaped to form a millstone (e), but this was abandoned in an unfinished state. 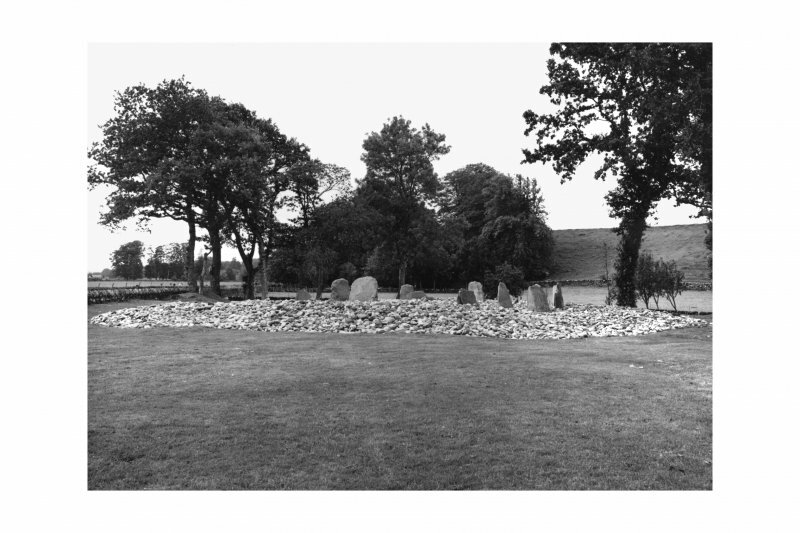 Both of the cairns which were constructed outside the stone circle on the NE and W covered cists containing inhumation burials. The NE cairn measures some 3m in diameter, the kerbstones of the SE quadrant remaining intact; elsewhere the perimeter was represented only by the trench from which the kerbstones had been removed in antiquity. The central cist (1m by 0.6m and 0.6m deep) was covered by a massive slab (1.65m by 0.95m and 0.l5 m thick); on its pebble floor were found a fine Beaker, three barbed-and-tanged arrowheads and a flint scraper, all of which had probably accompanied an inhumation burial, as the phosphate analysis of the floor deposits clearly suggests. 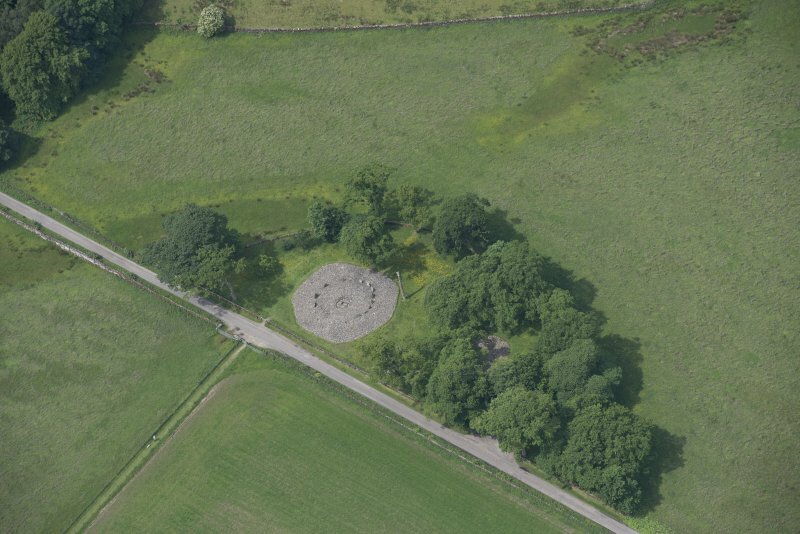 The W cairn held a cist (1m by 0.6m and 0.5m deep), which was covered by a large slab. The cist was floored with flat stones, on which there was a thin layer of gravelly earth containing only the tooth of a child aged between four and six years. A strong phosphate reaction from the earthy fill suggests, however, that there was formerly an inhumation burial, of which only the tooth survived. The cairn measured 4.2m by 3.6m and 0.5m in height, and had a carefully constructed perimeter of upright stones linked by drystone walling in a 'post-and-panel' style. 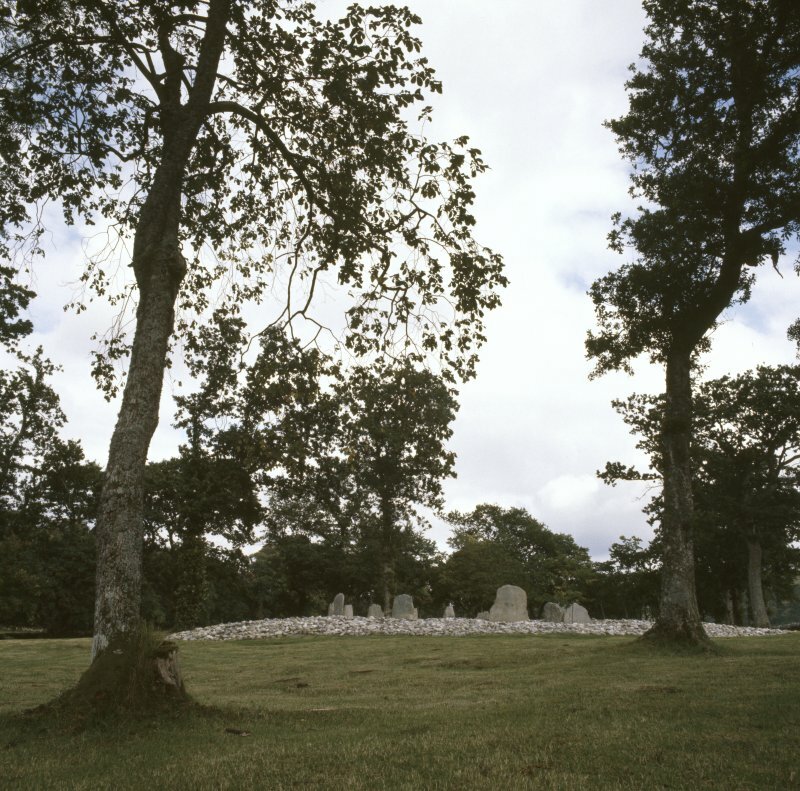 The cairn is not circular, and it may be suggested that the straighter E flank has been designed to respect the position of the upright of the earlier stone circle 0.7m to the E.
Other burials were deposited within the circle. The central cist, which was covered by a cairn with a low kerb, measured 1.4m by 0.8m and 0.65m deep. It was composed of four very large slabs and was set in a pit in such a way that it was partly below and partly above ground level. The N end-slab was over l.3m in height, but its lower edge was set 0.75m below the level of the floor of the cist in order to keep its upper edge on a level with those of the side-slabs. The S end-slab was also set in a deep socket. 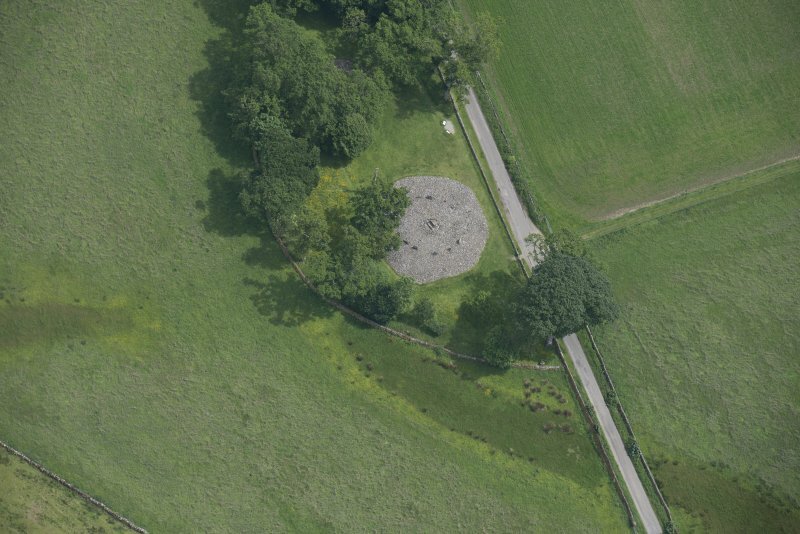 Any capstone appears to have been removed before the early 19th century, for, although a hollow in the centre of the cairn is shown on Daniell's coloured engraving of 1813, there is no sign of any cover slab (Daniell 1818). The kerb consisted of upright slabs 0.3m high with a 'false portal' setting on the inner side of the ring in the SE quadrant. Much of the kerb was destroyed in recent years, and its position is shown as a narrow trench on the plan (0.35m deep and 0.1m to 0.25m broad); the ring of stones that is visible today is largely reconstructed. Cremated remains were found both in the central cist and in the small box-like setting of the 'false portal'. The cist, the ring of upright slabs and the setting were all subsequently sealed by cairn material. 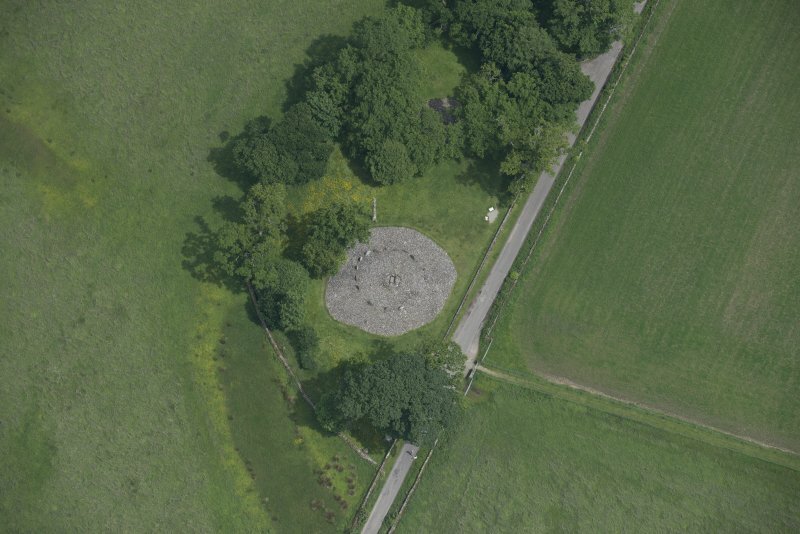 To the NE of these central structures there is a small kerb-cairn, 2.5m in diameter and 0.75m high, with a 'false portal' arrangement on the SE; at the centre of the cairn there was a cremation in a pit (0.7m by 0.8m) covered by a flat slab. A later burial was found at a higher level, probably inserted at a stage when the cairn was enlarged and the uprights were enclosed within an outer slab-built kerb. A further cremation deposit was found to the SE of the central burial; it lay within a setting of flat slabs defining an area 1m by l.lm externally and 0.6m by 0.6m internally. 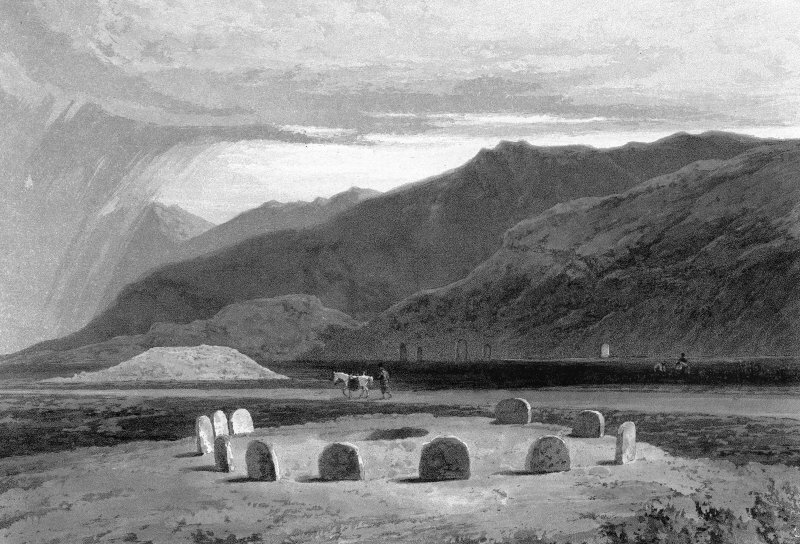 The role of the uprights of the stone circle as free-standing monoliths was completely changed by the addition of smaller orthostats designed to fill the spaces between them and to form a closed ring; this ring was thus composed of the taller stones of the circle and the lower slabs, here described as 'interval slabs'. In one instance horizontal slabs were found on top of an interval slab. This ring of uprights formed the internal revetment of a bank of stones that enclosed the stone circle and covered the cairns on the NE and W. It is uncertain how this external bank was constructed, and it is possible that the interval slabs had an independent existence before the building of the bank itself. The interval slabs stood to heights of about 0.4m above ground level, and some of the stones of the circle were trimmed so that these slabs could be neatly set in position. Excavation has shown that the upper part of the bank, as at present visible, is of recent origin and may be the result of field-clearance. Early in the second millennium BC, peat began to form over the site. A ditch on the W side, which ran past the edge of the bank, appears to be ancient in origin, but to have been recut in more recent times, perhaps in the course of drainage and peat-clearance during the 19th century. The state of the site in the early 19th century is shown in the Daniell engraving mentioned above, which also illustrates peat-cutting in progress. A manuscript note accompanying the Hutton Drawings (Nat Lib of Scot Adv Ms 30.5.22 (Hutton drawings) no.23k), in the National Library of Scotland is dated to 30 May 1818: ?Rasella near Kilmartin Loch Crenan Argyishire. Mr Daniell informed me that several years ago (probably about 25), a great many Coins were found in the excavation in the Center of the Druidical Circle, which were afterwards distributed among various hands'. This presumably records the discovery of a cache of coins, perhaps of medieval date, but none appears to have survived.3 During the 19th century the site was masked by field-gathered stones~ Later that century the trees around the circles were planted and the grove was given the name Half-Moon or Temple Wood. 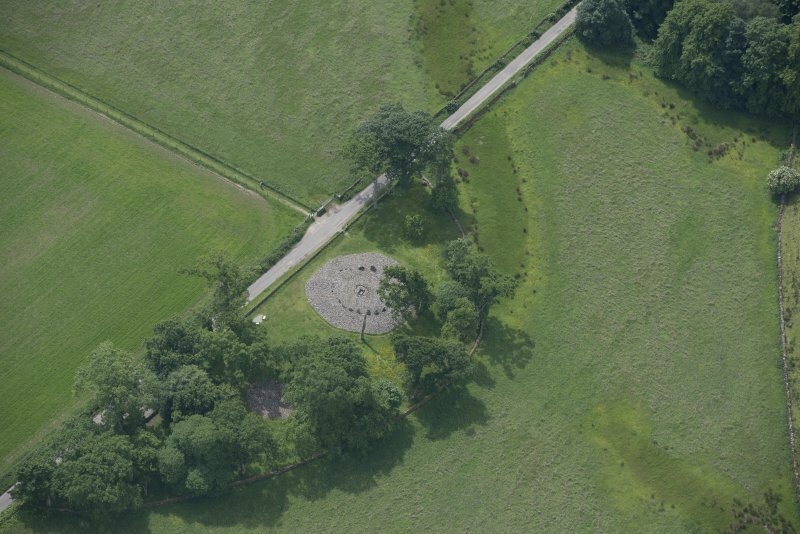 The North-East Circle, which was discovered in 1979, has been reconstructed with concrete markers to indicate the two main phases of activity, the earlier being a timber setting (circular markers), which was subsequently replaced by upright stones (rectangular markers). The timber posts, set upright in deep sockets, were carefully positioned with the four largest posts in pairs some 10m apart. Because the posts were later removed, it is not certain how many were standing at any given time, but there were certainly six, and possibly a further three, and there was also a post at the centre of the ring. 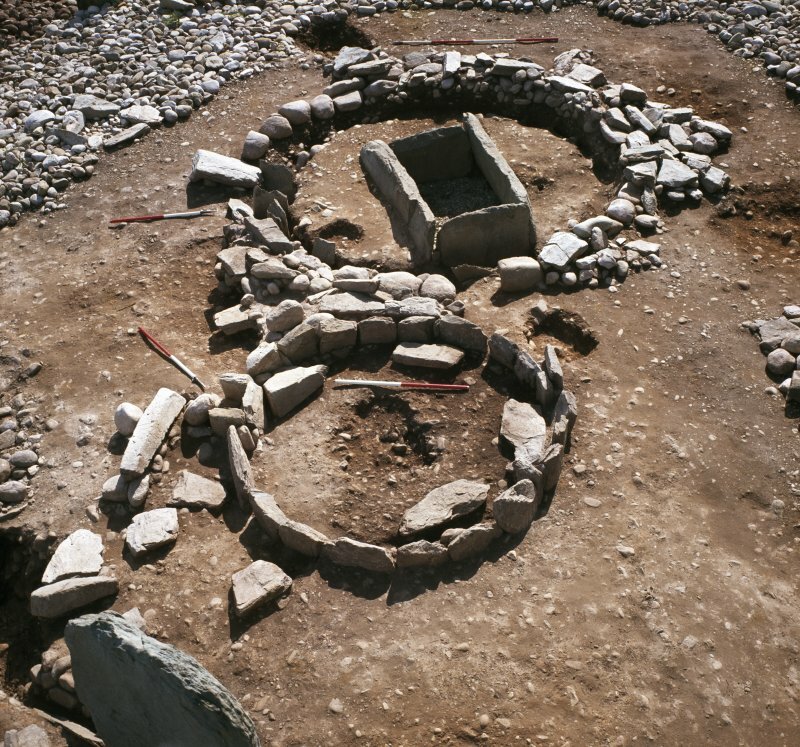 After the post-ring was dismantled, preparations were made for a stone setting, the stone holes being dug and at least five stones erected, with an upright slab at the centre. The setting was elliptical rather than circular, measuring 10m by l0.5m; one of the uprights is still visible, and the stump of a second was found during the excavation, as well as traces of two other stones, all within the western arc. The two stones of the setting and the central stone are indicated on the plan; the positions of stones which were slighted in antiquity and of stone-holes that were dug but not necessarily filled are also shown on the plan. Parallel to the central slab and 1m to the W there was a shallow hollow, which may have been the socket for a second upright. Analysis of a charcoal deposit in the socket for a stone has provided a radiocarbon date of 3075 bc ? 190 (GU-1296), and it is clear that the circle was dismantled in prehistoric times and finally covered by a layer of cobbling. Many of the elements of this pair of sites join to make them unusual and in so doing remind us that the groups, categories or 'norms' of the archaeological record are to some extent illusions. To the north-east there is a stone circle which was discovered in the course of recent excavations; measuring about 10.5m by 10m, this site was of two periods: a timber circle, the posts of which have been marked by round concrete pillars, and a stone circle, most of the uprights of which were subsequently removed, but one remains in situ. 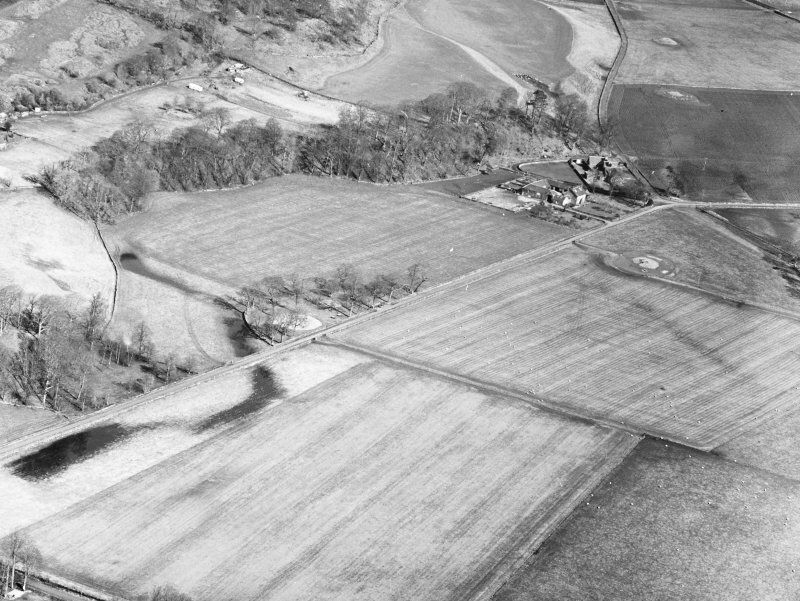 A radiocarbon date shows that this is one of the earliest circles in Scotland. 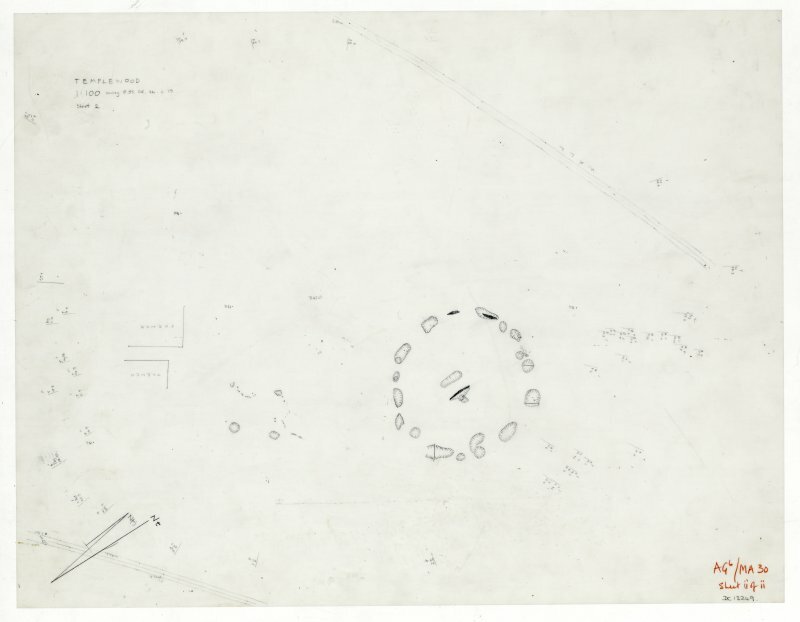 The sequence of construction of the larger and better known circle has been made much clearer as a result of excavation and is explained on information-panels on site. 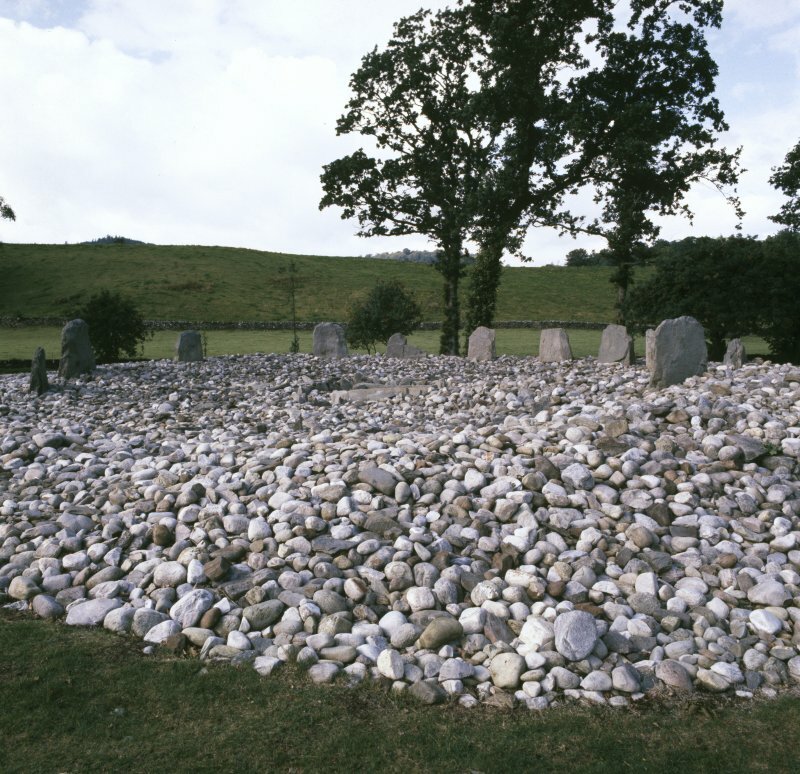 The circle of upright stones, about 12.2m in diameter, was the architectural focus for burials over many centuries with several periods of reconstruction. As displayed today the site shows the last phase of rebuilding, when it was largely covered by a stone cairn, though some of the capping may be comparatively recent One small cairn, built immediately outside the circle to the north-east contained a cist with a Beaker vessel associated with three flint arrowheads and a flint scraper, but there were no burial remains. This cairn, like a second, which covered an empty cist (presumably also an unaccompanied inhumation burial), is now sealed by the bank of cairn material outside the stone circle. 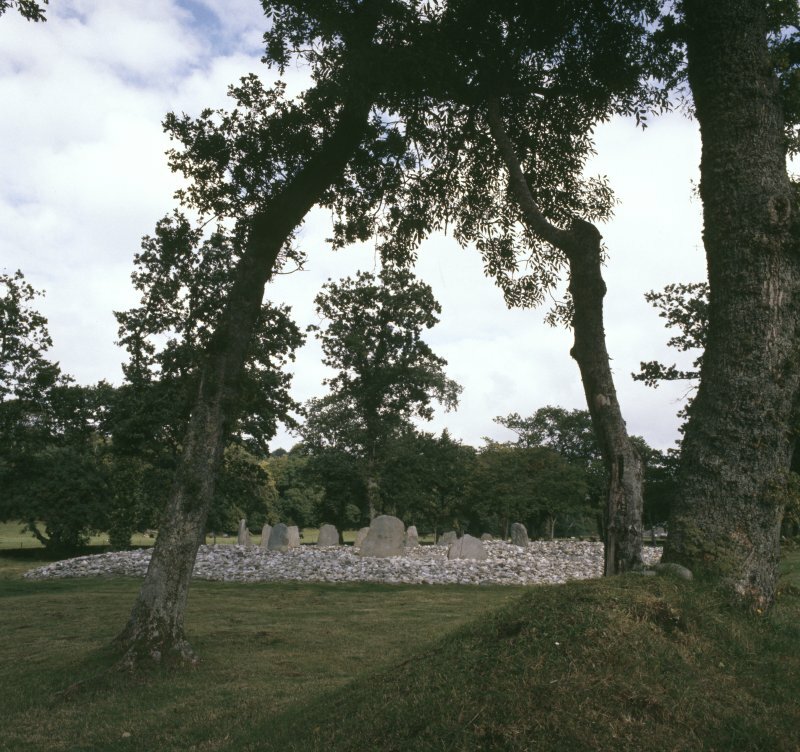 Excavation in 1929 revealed that the cist at the centre of the circle had already been rifled, and thus its chronological position is uncertain; the kerb-stones of the cairn that enclosed it were, however, later destroyed, and the present stones are largely reconstructions. The cist is a well-built one, measuring 1.4m by 0.8m and 0.5m in depth, and is comparable in size to several in the adjacent monuments. One of the most unusual features of the stone circle is the presence of a pecked double spiral on one of the stones, one half on one side and the other on the next face; it is unlikely that this carving is of two periods as has sometimes been suggested. A watching brief was undertaken on 19 September 2011 during the installation of upright wooden posts holding electronic people counters. No finds or features of archaeological significance were recorded during the excavation of six shallow holes.